These miniature acrobats are a peaceful place to rest your gaze and a reminder to stay balanced. At the end of a yoga practice, chakras aligned, mind still, do you ever find yourself saying, "Nama-stay here"? With this playful bracelet, you can keep a beautiful reminder of the asanas nearby after you leave the studio. 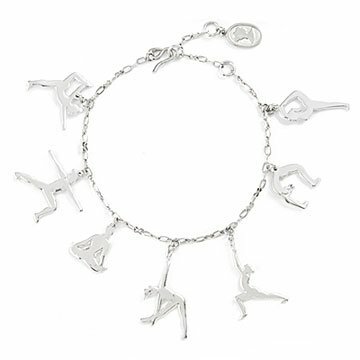 Designed to embody a balanced practice, the sterling silver-plated poses include: Lotus, headstand, dancer, triangle, warrior I, warrior II, and wheel. The miniature acrobats serve as a peaceful place to rest your gaze and give your ensemble a balanced energy. Handmade by Ariana Ost in New York. Soft jewelry cloth, hand polish. I loved this product out of the box. It was everything I wanted it to be. Feminine, delicate, and a perfect reminder of the presence of yoga in my life. I am disappointed in the sliver plating though. After a short time, the silver has turned a slight bronze. It makes the bracelet appear dingy, so my love for the product has greatly diminished. Beautiful idea. Great for daily wear, I get so many compliments, especially from fellow yogis. I will not wear during my practice in the event the delicate pieces could be damaged. That's just me, I know it is common that others wear jewelry during practice. Thanks Ariana!